Would you bet if you knew you could win every time? Now it's possible and we will do our best to show you how in the text below. Explained with few words, sports arbitrage means to take advantage of an odds differential between two competing bookmakers. You are placing bets on both teams to win and at the end you will get profit no matter the outcome. To be clearer, we are going to explain what this means in details. Everybody know what is arbitrage. Arbitrage is a well known financial practice of buying low and selling high on two different markets simultaneously, making an instant profit. Arbitrage is almost the same as Sports Arbitrage, but the difference is that in arbitrage betting instead of "prices" there are "odds" and instead of "markets" there are "bookmakers". You have to place a bet on both bookmakers by covering all the possible outcomes of the game and for this, you are guaranteed a profit. One of the good things is that these situations appear thousands of times every day and many people could get the good feeling of profitable investment by taking advantage of it. Everyone is making good money from it and for some of them this has transformed into a profession well known as "Arber". There is no doubt that arbitrage is 100% legal because the arber is simply taking advantage of the odds differential from two or more bookmakers. There is nothing wrong with this and it's approved by the law. Other questions is if betting is forbidden generally by law in your country of residence. If your country law forbids online betting, it could be the only thing to stop you practicing arbitrage betting. It might sound unbelievable, but there are actually people that went to live in a different country just to start their arbing career because the law there allows them to bet on sports. But you shouldn't be surprised because you should look at sports arbitrage betting as an investment, business, a chance for a successful career instead of gambling because there is nothing familiar with regular gambling. It is actually closer to forex trading. As you already know thousands of arbitrages appear each day, but there are few important things you need to know what could surprise you badly. Each arbitrage could exist from few seconds to few minutes.Here is where the importance of speed comes. If the service you are using is scanning and delivering slowly the odds, you will have less time to react and bet on the arbitrage. For example, imagine if the arbitrage between two bookmakers for InPlay appears at 8:00:00 and this arbitrage will exist only for 30 seconds till 8:00:30 because of its good percent of profit. If it takes 17 seconds for the surebet service to show its customer that there is an arbitrage situation these 17 seconds will already be passed and you will have only 13 seconds to react and bet on both teams to win before the arbitrage disappear. This is not good and you definitely must search for a service that scans and delivers the odds faster. Another situation you can get to is if you are just about to cover the other outcome and suddenly the arbitrage disappear and you have covered only half of the possible outcomes. This could be because someone else who is using faster sure bet service than yours, have already taken advantage of the same surebet before you do and that leads to the disappearing of the selected arbitrage from your list. This happens because he saw the arbitrage few seconds before you do because his service finds and shows the arbitrages faster and could take advantage of it before you even know for its existence. The feeling is really bad and the way to avoid it is by choosing a fast software that finds the arbitrage situations before the other services do and this way you will be the first to know if an Arbitrage situation exists. Currently, the oldest Sports Arbitrage service (since 2006) on the market - OddStorm provides the fastest scanning and odds delivery to its clients. It scans and delivers the odds for total 1-3 seconds for InPlay and 15 seconds for PreMatch. 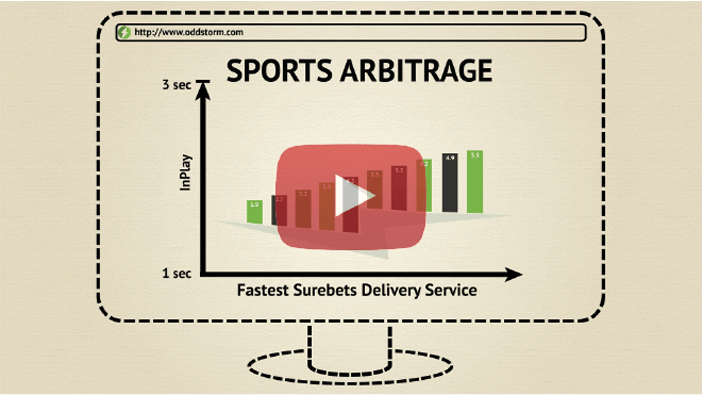 As you can see speed is everything in Arbitrage betting and that's why we recommend you to use the global fastest sure bets delivery service on the market - OddStorm and that's why we are using it as an example for our guides. 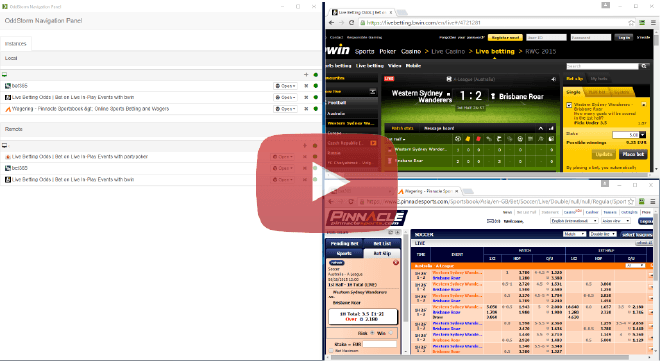 Till now we could say one thing for sure - speed is everything in sports arbitrage betting! The most important thing is to choose a service that will be the first to send you the list with surebets. There is also one more important feature that will help you to be the first to take advantage of the arbitrage situation. It is called auto-navigation. Normally, after choosing on which arbitrage you want to place bets you have to find manually the betting event on each bookmaker to place the bet and this also takes time. OddStorm has developed a unique auto navigation that leads you directly to the betting event page with a single click and all you have to do is click "bet". This means you won't need to find the events manually and they will do all the job for you. This leads you one step ahead to be the fastest arbitrage bettor. Sports Arbitrage is one great opportunity to work for yourself and from your home and could offer you great emotions and money in return. But as every investment, you will need to spend some time learning the basics and the tricks to become a successful arber. Thousands of people are taking advantage of it but there are also thousands that couldn't handle it. If you believe you can do it and want to learn more, Arbitrage Guides is the perfect place where you can learn everything for betting on surebets. We have prepared one free and one paid course that will get you from newbie to a professional arbitrage investor. The Complete Arbitrage Guides course includes many video tutorials, actual examples and articles for everything you need to know to become a successful arber. 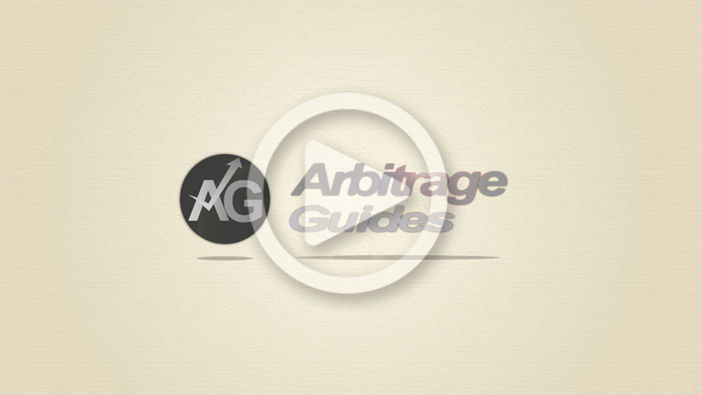 To get an idea of how it will look like, our team have prepared a Free Arbitrage Guides Course. We are excited as you are and will be more than happy to help you go through all the process of learning. This is just one wonderful service. I have been practicing sports arbitrage betting for two years and was hard for me at the beginning. I feel bad that haven’t discovered this service earlier. I have go through both of your sports arbitrage guides courses just from curiosity and can say that they include everything what you should know for arbitrage betting. I strongly recommend it to all of the beginners to first go through it before starting betting, because it will save them a lot of troubles for example losing money because of not understanding the risks and how to react when mistakes happen. Good job Arbitrage Guides! Keep helping the new arbitrage bettors! I also bought this complete sports arbitrage training course and it worth it for sure. Very easy explained, a lot of examples, great customer support. The video tutorials are well made. I am now betting at OddStorm and if it wasn’t this course to learn the risks it was going to take more time and lost money maybe. Thanks God now everything is fine with me, I am making good money by OddStorm and will make more when I get more experience. Good job Arbitrage Guides! Thank you for the good words! We are doing our best to help you go through it and start winning money immediately. We want to let you know that OddStorm is preparing to add Tennis and Basketball to their sports and we will update the Complete Arbitrage Guides Course with tutorials and examples how to bet on Tennis and Basketball. They also will add Betfair. If you have purchased once you won’t need to purchase twice to get the updates we are about to make. Just stay with us and we will keep you updated with all the news in sports arbitrage betting! Thank you for being our students. Wish you happy arbing and don’t hesitate to contact us if you have any questions. That’s great. Thank you. I am subscribed to your newsletter so I hope you will let me know when the updates are done. Great course again! Great article. Thank you for guiding us through the process of learning. The paid course was in huge use for me. I have successfully placed few surebets and am ready to go deeper in this world. Good luck everyone! You guys are the best! Very well explained courses and good customer support. It helped me a lot. I was very impressed by their customer support. They even made a Teamviewer connection to help me start up. Great courses and support attitude. Amazing service and team. Keep doing such good job. I am making more than good money now thanks to your help!